Airship Ventures: Something in the Air? A tidbit that might amuse. Back in 1896 and 1897 there was an ‘airship flap’ across several states of the USA, starting in Sacramento. Today this would undoubtedly be referred to as a UFO flap, but UFO’s hadn’t been named as such then. People saw a bright light in the sky and interpreted it in the context of what they had seen or heard about at the time. In this case, some kind of airship. 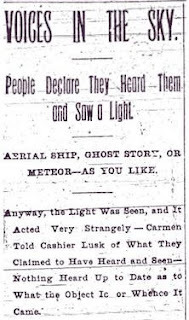 Some of the most detailed descriptions come from the then farming town of Lodi, California, where letters to the paper speculated on the probable Martian origin of these craft (Percival Lowell published his first books about canals on Mars beginning in 1895). Indeed, one correspondent claimed that the Martians were so advanced that they could surely tune in to modern telegraphy. Mars is a popular origin of airships, but actually could be explored reasonably well with some sort of solar powered airship. A web search will bring up a few links such as this technical document. Venus was at maximum brightness during most of this period. It still tops the list today as the object most likely to be mistaken for a UFO. Although one would hope that rural folks 100 years ago would be more familiar with the skies than the city dwellers of today, and surely should have been familiar with Venus. I guess not.